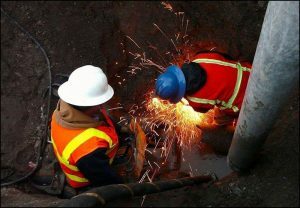 Water sector workers cut a conduit out of a main that had been bored through by a contractor. Photo courtesy of Lance Fisher and Tom Gordon, Taylorsville-Bennion Improvement District (Utah). While water and wastewater treatment professionals may not be able to stop speeding locomotives or see through walls, many of their admirers would describe the work they perform every day to protect their communities as heroic. During March and April, Water Environment & Technology (WE&T) magazine asked readers to share photos of the sanitation superheroes in their utilities, laboratories, and offices. As the fourth in an ongoing series of photo contests hosted on the Water Environment Federation (WEF; Alexandria, Va.) Facebook page, winning images were selected by the number of votes they received on social media. This contest’s submissions demonstrated that, for public health and the environment, a face mask and cape is no match for a hard hat, a bright safety jacket, and some know-how. Tricia Garrison, Green Bay (Wis.) Metropolitan Sewerage District, in third place. Beginning in the June edition of WE&T, read the “From the Field” section for more information about contest winners and their photos. The next photo contest, “Watershed Moments,” will be open for submissions on June 1.